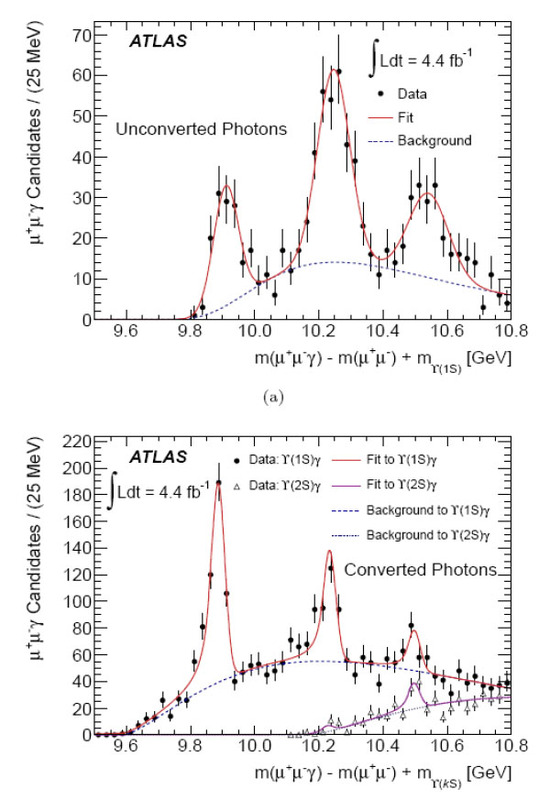 The ATLAS collaboration has announced the discovery of the b(3P), which is a bound state of a bottom quark and bottom antiquark ( ). Bound states of a heavy quark and its antiquark are collectively called quarkonium. They are the QCD (Quantum ChromoDynamics or strong force) analogues of the hydrogen atom, with each new particle corresponding to a different energy level. For states, the P states are called b (chi b) and the S states (upsilon). Like the hydrogen atom, we can observe transitions between these states through emission of a photon , and this new state was discovered through the radiative transitions b(3P) → (1S) + and transitions b(3P) → (2S) + followed by the decay of the upsilon (itself a lighter quarkonium state) to two muons. Read the full article… (“Atlas News”). (The spectrum of the b states: the leftmost peak is the b(1P), the middle one the b(2P), and the rightmost the new b(3P). The upper plot shows the spectrum for decays involving unconverted photons, while th lower plot shows the spectra for decays involving converted photons. In the lower plot, the upper (red) curve shows the spectrum for b decays to (1S), while the lower (brown) curve shows the spectrum for decays to (2S). (Only the b(3P) peak appears distinctly in the lower spectrum because it is the only b state with decays involving enough energy to be detected in this study). Galleria | Questa voce è stata pubblicata in Scienza: le news e contrassegnata con Atlas, CERN, particle physics, QCD, quantum chromodynamics, Standard Model. Contrassegna il permalink.